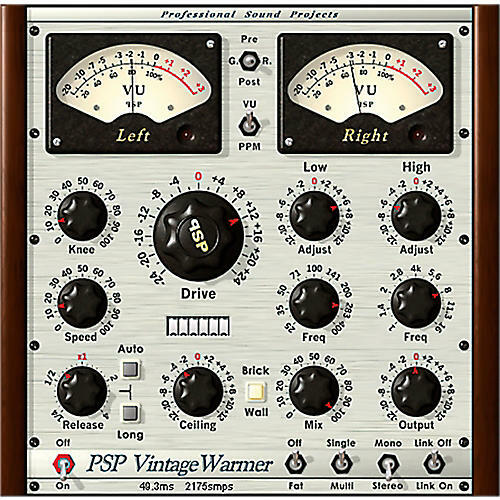 PSP VintageWarmer2 is a high-quality digital simulation of an analog-style, a single- or multi-band compressor/limiter. It combines rich, warm analog processing with a straightforward user interface, and comes with a comprehensive library of presets. The plug-in processor is highly flexible and can be used for both softknee compression and brick-wall limiting, which makes it an essential tool for mixing and mastering engineers. Careful attention has been paid to PSP Vintage Warmer's overload characteristics with the processor being capable of generating saturation effects typical of analog tape recorders. PSP Vintage Warmer also incorporates professional VU and PPM metering together with accurate overload indicators thereby assuring professional quality results. Due to technical limitations the PSP VintageWarmer2 version 2.5.0 is available in the non ilok version only.